Background image of Sign in Japanese from a sewage treatment center on Eastern Island, Midway Atoll National Wildlife Refuge. Photo By USFWS of Tohoku tsunami debris. Edward Wolf talks with author Bonnie Henderson about living with tsunamis. Coastal towns and harbors from Vancouver Island south to Cape Mendocino, California occupy the leading edge of North America where a chunk of the earth’s crust, the Juan de Fuca Plate, dives beneath it in the process geologists call subduction. The tilted seam where those two plates meet, a 600-mile-long offshore fault known as the Cascadia Subduction Zone, remains out-of-sight and out-of-mind for most residents of the Pacific Northwest, as silent as the snow peaks that define our home ground. In the last twenty-five years, scientists have replaced the illusion of tranquility with a 10,000-year history of offshore earthquakes as powerful as any on earth. Like others around the Pacific “Ring of Fire,” Cascadia earthquakes cause tsunamis that scour low-lying coastlines, estuaries, and river valleys. None has swept our coast from the Cascadia fault since January 1700. Scientists believe that the next could strike, without warning, at any time. How was this history pieced together? Who is working to address the risk? And how are we, coastal residents and visitors alike, to live with an ocean more capricious than we had imagined? Oregon author Bonnie Henderson tells the story in The Next Tsunami: Living on a Restless Coast (Oregon State University, 2014). An author whose previous book, Strand, traced the trans-Pacific connections revealed by marine debris, Henderson combines a knack for storytelling with her abiding love for the Oregon Coast. Edward Wolf spoke with Henderson about the book, her own relationship with the coast, and some of the innovators shaping the science, planning, and policies needed to build resilience on this restless shore. Tom Horning, the geologist who is a central character in The Next Tsunami, seems to feel an unusual affinity for these great waves. What is Tom’s story? Tom had an absolutely pivotal, primal experience as a ten-year-old boy in Seaside, Oregon on March 27, 1964: Being awakened at midnight to find that, while he was sleeping, his own lawn had been transformed into a beach, complete with drift logs and dead fish and gobs of foam almost as tall as he. To the surprise of nearly everyone at the time, Oregon’s North Coast had been swept by a “distant tsunami” generated by a powerful earthquake in Alaska’s Prince William Sound region. Marry that experience with an intense curiosity about how the world works, and you form a keen interest in witnessing the next Big One. Tom, like most of the scientists that I met in the course of researching the book, possesses this wonderful combination of curiosity, intelligence, and a child-like sense of wonder and amazement. Tom is confident he will be able to outrun the tsunami, if it strikes in his lifetime. He has experienced loss, and understands that it is part of the natural order of things. So what’s not to love about a phenomenon this big, this profound? How has the experience of writing about tsunamis changed your own relationship with the coast? At first, frankly, I was more fearful. I still went to the coast, but I worried. That changed over time. I don’t obsess about tsunamis anymore. I do tend to be aware of what direction I would need to go if the earth started to shake. There are places where you would simply be out of luck: walking on the beach at the dunes on the central coast, for instance, or at the end of a long sand spit. I don’t avoid those places. I just don’t worry about it anymore. There are many other things more likely to get you on any given day, on the Oregon Coast or anywhere else, than a once-every-250-to-1,000-year tsunami. Name some Oregonians who stand tall as pioneers in the effort to build tsunami resilience. Doug Dougherty, definitely. Superintendent of the Seaside School District. Three of his district’s four schools are located just a few feet above sea level (a fifth, Cannon Beach Elementary, closed its doors in 2013). The next earthquake will topple some of those schools, and what’s left of them will be swept away by the tsunami. He has taken the risk very seriously. In the short term, he has equipped and trained each of his school principals in ham radio operation: the quake will knock out power and probably cell phone service too. He’s been working diligently to figure out a way to move the town’s entire school district to a new high-ground campus. It’s a tough sell for a variety of reasons, not least of which is the price tag, despite the clear risk of not doing it. I admire him. Scientific pioneers include Curt Peterson, a geologist at Portland State, who was the first to find evidence of earthquakes and tsunamis on the Oregon Coast. George Priest, with Oregon’s Department of Geology and Mineral Industries (DOGAMI), who drew the first tsunami inundation line for the entire Oregon coast in 1995. Yumei Wang, a geohazards engineer also at DOGAMI, who has been active in promoting safe-haven options for coastal communities. Chris Goldfinger at Oregon State University, whose meticulous 10,000-year history of seismicity on this coast supplies the basis for our best guesses about when the next Cascadia quake might occur. 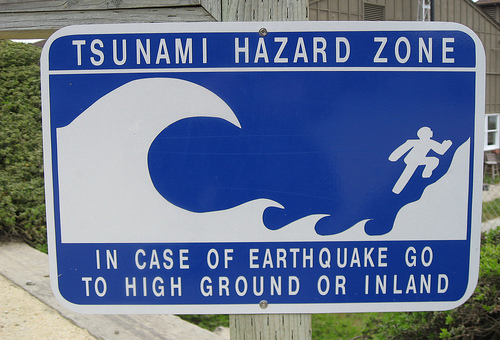 And let’s not overlook the folks who designed the graphics for Oregon’s tsunami evacuation signs, symbols that are now in use all over the world! How has Native American knowledge contributed to our understanding of tsunami risk? Native Americans’ stories—those that have survived to this day, on paper or in recordings, or are still being told—clearly document every discrete and observable element of a Cascadia earthquake and tsunami: liquefaction (wet sand and soil losing strength in the earthquake); subsidence (land along the coast dropping a few feet during the earthquake, forming new or larger bays); and “prairie becoming ocean,” where the sea flows over places it had never been known to inundate and doesn’t completely flow back out. With uncanny accuracy they recount the destruction of entire communities, even the smell of the bodies of dead people and animals rotting on the shore. All this knowledge, preserved for hundreds of years, intact. Few outside the Native community paid any attention until quite recently. Photo By ODFW of Tohoku tsunami debris. A small vessel caught in the Japanese Tohoku tsunami in 2011 was found near Horsfall Beach, north of Coos Bay, Oregon, in February 2013. Photo courtesy of the Oregon Department of Fish and Wildlife. Take us to a place on the coast where you can see the evidence of past tsunamis. Now that I know how to read the landscape, I see signs everywhere. Each of the parallel dunes of the Clatsop Plains between Seaside and Astoria, for example, documents a Cascadia earthquake and tsunami. But an everyday place that comes to mind is a feature just east of the end of Third Avenue in Seaside, not far from Broadway Middle School. The best explanation for that odd little arm of Neawanna Creek, it turns out, is that it was formed by the retreat of the last Cascadia tsunami during the night of January 26, 1700. That mid-winter date should be designated as an official day of remembrance in Oregon, a teachable moment we owe to our future. Edward Wolf writes about sustainability, natural history, and earthquake safety in the Pacific Northwest. He is the author of Salmon Nation (Ecotrust, 1999), Klamath Heartlands (Ecotrust, 2003), and a contributing author of Worldchanging: A User’s Guide for the Twenty-First Century (Abrams, 2006 and 2011). He helped to write the landmark Oregon Resilience Plan created by Oregon’s Seismic Safety Policy Advisory Committee in 2013, and currently serves as an appointed member of Oregon’s SB 540 School Capital Improvement Planning Task Force. Bonnie Henderson, author of The Next Tsunami: Living on a Restless Coast, is a veteran journalist, editor, and researcher who lives in Eugene, Oregon. She is the author of Strand: An Odyssey of Pacific Ocean Debris, which was a finalist for the 2009 Oregon Book Awards, and two popular hiking guidebooks: Day Hiking: Oregon Coast and Best Hikes with Kids: Oregon. Today, she is focused on using writing to explore the intersection of the natural world and the human experience close to home. Photo at top of 2011 Tohoku tsunami debris courtesy of the U.S. Fish and Wildlife Service.